L'Ami v Laznicka, European Union Championship, 2008, eighth round, position after White's 59th move, in which he took the last pawn on the board and thereby created the unusual ending of two bishops against a knight. Attempts have been made to show that two Bs win against Kt in all positions, but the prooofs are inconclusive. Half a century later in Batsford Chess Endings (1993) Jon Speelman was of a different view, giving four different ways to break down the "Horwitz and Kling fortress" (which can be seen here) which process takes, if Wikipedia is correct, a maximum of 45 moves with best play. 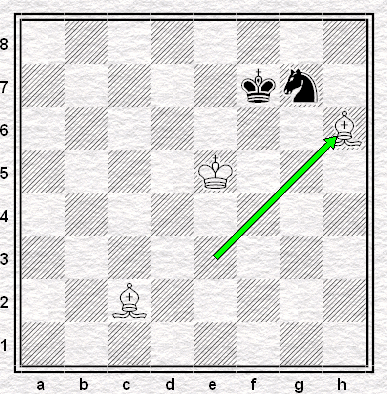 One assumes this means 45 moves until the knight is captured: the point is worth raising, since you'll see different figures used in these situations, and those different figures mean different things. When, for instance, I entered the diagram position in the Nalimov Tablebase it informed me that Black loses in 55 moves. Ah, more than 50, I thought - until I realised that of course this was 55 moves until mate, a distinctly and importantly different yardstick. 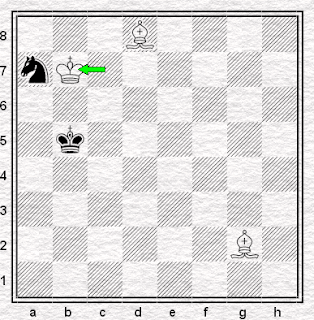 in which, on White's 38th move after capturing the final pawn, the knight is finally trapped. So, you ask, does this mean this is now a winnable ending within the fifty move rule? As it happens, not all positions of this type are won within the limit, since not only does it take nearly fifty moves to break down Kling and Horwitz, but it can take some time to get there in the first place, taking us well beyond the fifty. Wikipedia suggests 66 moves as the absolute limit, though Speelman gives 69 - so I can only assume that the analysis available to him a decade and half ago has been improved upon. For this reason, there was a period of some years in which the fifty move limit was extended for (mostly) pawnless positions of various types. In 1992 the rule was changed back and the fifty move limit was applied strictly to all positions, which, in fact, had not been the case before. Speelman gives two examples of the defender failing to hold the position: the second game of the 1961 Botvinnik-Tal rematch and his own defeat at Linares in 1992 by a very well-informed Jan Timman. Laznicka did all right on Tuesday, though: and L'Ami threw in the towel after seventeen moves. Whether through fatigue, frustration, or recognition that his opponent knew what to do and he did not, I cannot say. Personally I'd have no idea whatsoever what to do if the ending ever came up: probably I'd just move the pieces around the board and see what happened. But that's pretty much what I do most of the time.